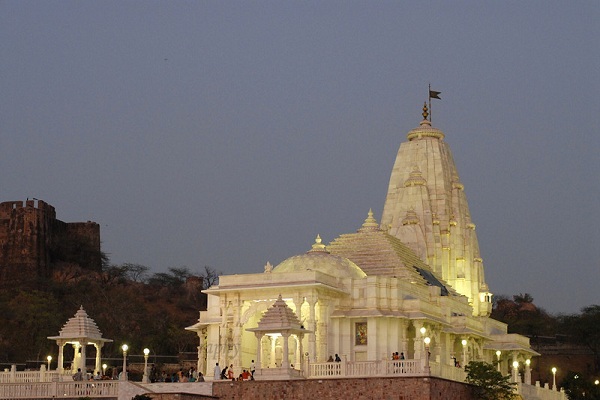 Lakshmi Narayan Birla Mandir or widely known as Birla Mandir, uniquely mixes modern architecture with ancient Hindu vastu concepts and create a magic no one can avoid. Located near the popular Moti Dungari Ganesh Mandir, Birla Mandir is made up of white marble and has a really huge compound around it. 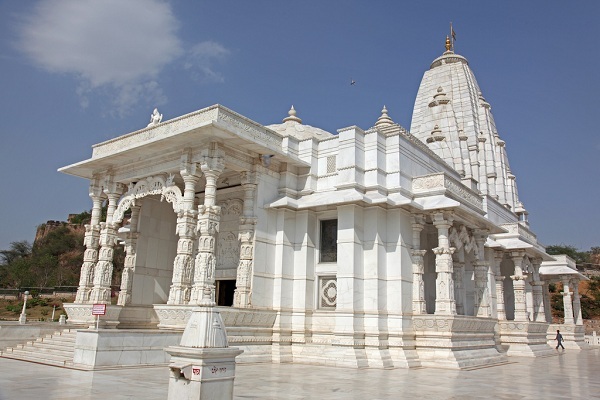 Because of its being on most prime location in Jaipur, this temple looks awesome piece of white marble from JDA circle. This temple was built in 1988 by the same Birla family who has built Birla Mandirs in Delhi, Hyderabad, Patna and over a dozen cities in India. 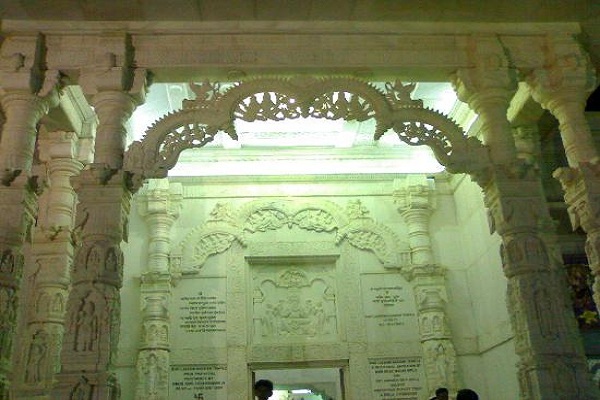 The sanctum sanctorum of the temple is covered with a huge huge dome made of finest quality white marble. One may observe lovely carvings of various Hindu gods and deities on the entrance of the sanctum sanctorum hall and its walls. Inside the hall, there is a full size idol of Devi Lakshmi and Bhagwan Narayana. The spectacular idols are always draped in lovely and quite expensive Poshaks. Spiritual tunes of Anup Jalota, Hari Om Sharan, Hariharan and other singers echo the whole place gives the devotee so relaxing experience, he can never forget. Mahantji of the mandir performs aarti, bhog and puja of Lakshmi Narayan and, distributes charnamrit and prasad among visitors. There is also a beatiful parikrama around the garbh griha, where we can see drawings and carvings of Hindu Mytholical events including Samudra Manthan. Each of the three sides of the parikrima has a special outer Jharokha where devotees can stand and watch the surrounding beauty. Step out side the temple and, you may see the statues of founders just facing gargh griha. Move a few steps further and, you will see lush green lawns, walkways and small prasad shops downstairs. 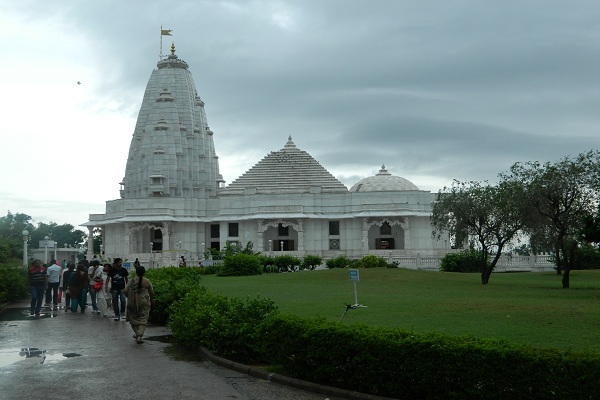 Overall, Birla Mandir is one of the most loved tourist attraction of Jaipur as well as a key center of devotion for Hindu devotees. Darhan Timings: The darshan opens for visitors at 6 am and closes at 9pm. Also, darshan's remain closed during day time 12pm to 3pm. The temple is at a 15min. driving distance from Airport, Railway Station & Central bus stand. App based taxis, auto rickshaw or bus are easily available.